To mark one year since the death of Stephen Hawking on 14th March 2018, The Royal Mint have issued this commemorative coin celebrating his life and significant contributions to science. The reverse design by Edwina Ellis has been approved by the Hawking estate shows a swirling black hole, the respected scientist's name and his most famous scientific equation relating to black holes – to significant that he requested that it be including on his gravestone. Edwina Ellis has been quoted as saying ‘Stephen Hawking made difficult subjects accessible, engaging and relatable and this is what I wanted to portray in my design, which is inspired by a lecture he gave in Chile in 2008. 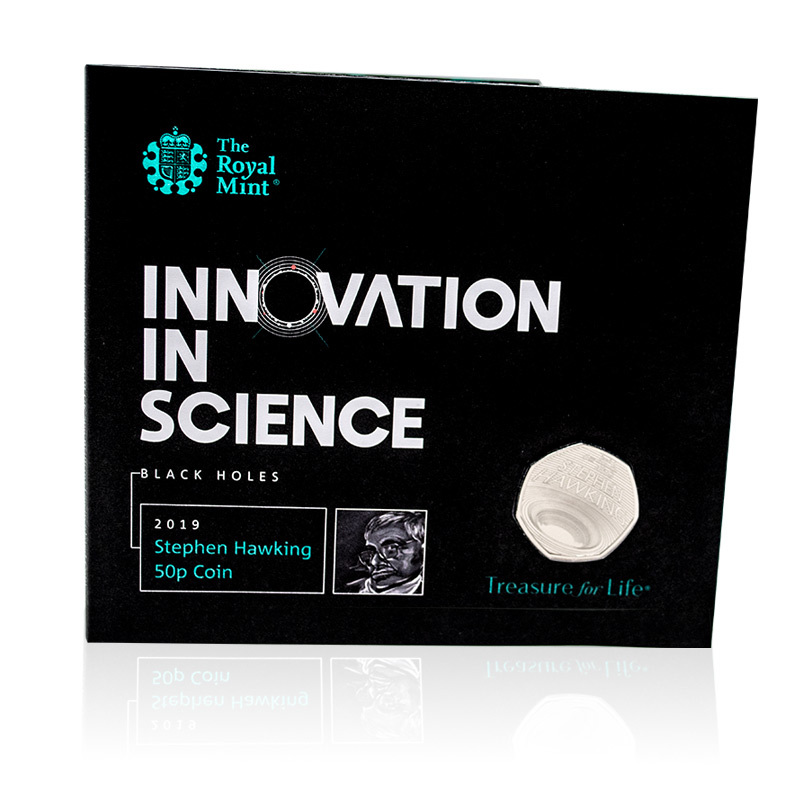 Whilst launched to mark Professor Hawking’s death, it was released two days before the one-year anniversary of his passing making this potentially the fastest ever issued commemorative coin from The Royal Mint – making it a notable collectable coin which is already in high demand upon its release. The coin is supplied in a presentation pack, and the design will never be released into general circulation so can only be acquired as a commemorative collector’s issue. 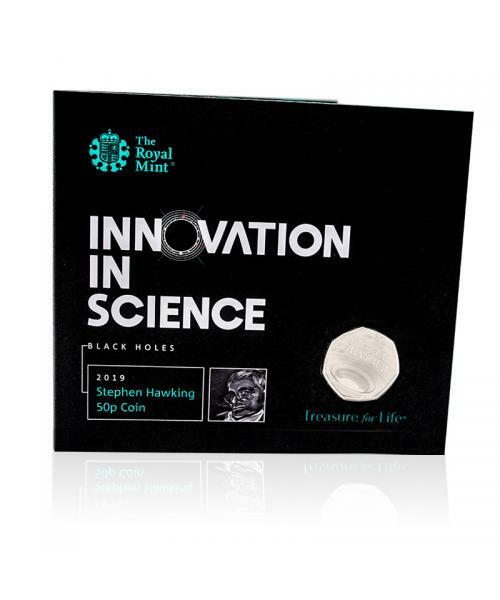 This is the first coin in a series celebrating innovators in science from The Royal Mint. Stephen Hawking was born in January 1942 in Oxford, England. He was a theoretical physicist, cosmologist and author who was director of research for the Centre of Theoretical Cosmology at the University of Cambridge at the time of his death in March 2018 and had previously been the Lucasian Professor of Mathematics at the same university from 1979 to 2009. Hawkings motor neurone disease diagnosis in 1963 came with a life expectancy of just two-years – but the professor surprised his medical team, and despite all odds being against him, he went on to have a hugely successful career and continued being one of modern times most significant scientific minds up until his death at age 76. Best known for his theories on back holes and his book A Brief History of Time, Stephen Hawking was the recipient of numerous awards, worked with scientific institutes around the world and inspired a generation. Stephen Hawking died on 14th March 2018, and his ashes were scattered at Westminster Abbey alongside the Grave of Sir Isaac Newton and Charles Darwin. Hawking’s life, it seems, was entwined in scientific importance from the start - he was born on the 300th anniversary of Galileo’s death and died on the 139th anniversary of Albert Einstein’s birth. Exclusive Coins stock all the latest releases from The Royal Mint. Sign up to receive our newsletter to stay up to date with the most recent releases or contact us for more information on a forthcoming coin.